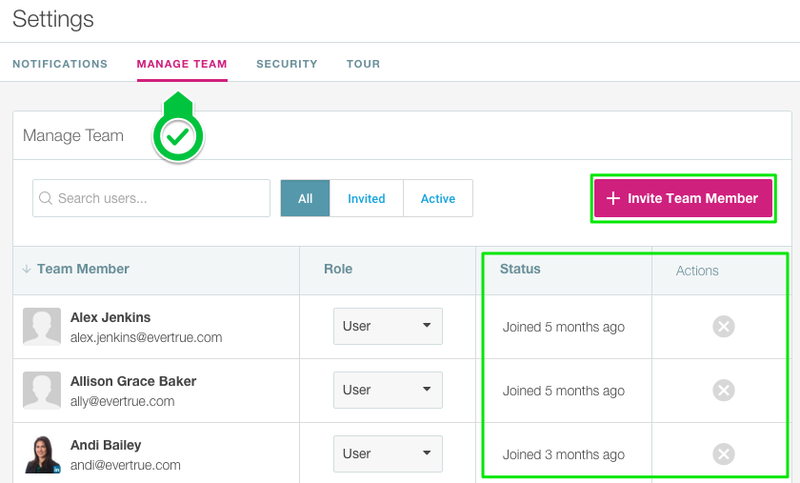 If you have been designated as your organization’s EverTrue Owner, you have the ability to invite your colleagues to become users. Follow the instructions below to get started and invite your team! 1. Open the User Menu located in the top right corner of the platform. 2. Select Settings from the drop-down menu. 4. Click " Invite Team Member" and a pop-up will appear. 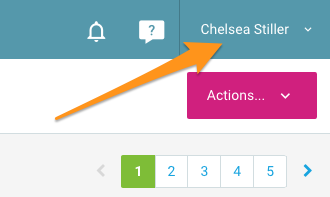 You can invite users one at a time or multiple users by separating their email addresses with a comma. Note, please only send user invitations to emails associated with your organization (see more below). Next, open the role drop-down menu to the right and select either "User" or "Owner" as appropriate. Most invited colleagues will be Users, unless they should also be managing the account with you, in which case they would be Owners. 5. Finally, click “ Invite Users” to email an invitation right to the individual! Each user will need to click the unique link provided in that email to log in for the first time. Please send all user invitations to emails associated with your organization. Not only is this the email the user will be registered with, but also where notifications and export file links will be sent from the platform. Each user will be required to log in using LinkedIn (see below for more information). Note that the LinkedIn credentials you use do not have to use your email associated with your organization. You can use any email address for LinkedIn authentication. Once logged in using LinkedIn, EverTrue will associate those credentials with their EverTrue user, which uses your organizational email. Each user invite is specific to that individual and cannot be shared. EverTrue user accounts cannot be shared and well as LinkedIn accounts cannot be shared. After a user has logged in for the first time and activated their account, they can access the platform by going directly to app.evertrue.com. To access EverTrue, all users are required to connect with LinkedIn. Click here for more information on LinkedIn Authentication and security.